Germans from Russia have moved to every continent on the planet. North America, South America, Germany, and Australia are just a few of the places, and many stayed in Russia. Connecting with our relatives is a big, yet rewarding, step for those of us on the genealogical road to adventure. If you choose to travel to learn more about your ancestors and your family, you can go it alone or go in groups. And, language skills help immensely, so the value of Tip # 7 goes beyond researching documents. One of the best books to help you prepare for travel is Carolyn Schott's Visiting Your Ancestral Town. Whether you are trying to go to your village in Russia, or connect with your German Origins in Europe, this book will help you efficiently plan and prepare yourself for what lies ahead. 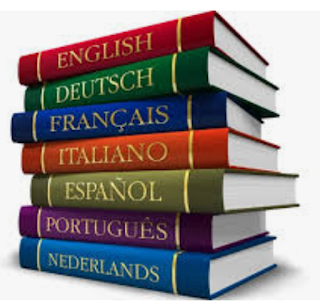 Learn a new language...sunds a bit daunting, doesn't it? I think I can read your mind…you think you are too old to learn a new language…but hear me out...there are a lot of reasons why this tip is crucial to tracking your German Russian ancestors. Many of the original records of your ancestors are written in a number of languages. And there will be times when you want to check the original records to verify your history. Some original records will be in German and Russian, and when you add in South America, it can be a handy took to know Spanish, too. Descendants of Germans from Russia relocated to countries around the world so any language skills are helpful. Learning a new language doesn't happen overnight. And there are ways you can begin to learn by using tools to help you recognize key words found in records. Learning occurs over time and here are a few tools to help you ease into learning. Tips & Tricks to Tracking Your German Russia Ancestors...TRICKS!!! Let's digress for a moment from the tips andtalk about some tricks in German Russian genealogy which can confuse and confound the best of us. Days, Dates and Calendars offer a unique challenge when looking at Russian records. Here is an example that caused me concern for a few days. My grandfather, Fred Herzog, was born on July 4, 1882. His death certificate confirms this date. And, my mother shared her memories of celebrating his birthday on the 4th of July, the same day the United States commemorates its independence with parades, picnics and fireworks. The two events were tied together for her. So when I received a Russian document showing his birth date as June 22, 1882, I thought I had information on the wrong Fred Herzog. Descendant of Germans from Russia are scattered around the world...North and South America, Australia, Europe, Russia and many more locations. And, there are many maps which can help you locate these settlements, and possibly locate your relatives. Many of the books, organizations and other sources I mentioned in earlier tips have plenty of maps which are excellent resources. 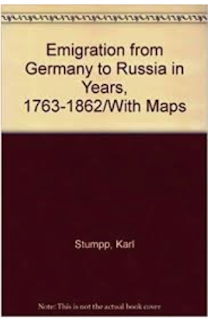 The book shown above, Emigration from Germany to Russia in Years, 1763-1862/With Maps by Karl Stumpp contains classic maps to introduce you to the movement of our ancestors. Mitch Roll's Volga German map, while not drawn to scale, is helpful to see the layout of the villages. Alan Wambaugh's map of the same area adds a frame worth map to your collection. And, be sure to check out the map of Entre Rios, Argentina, just in case you travel there. As promised, Tip # 4 continues with examples of how being involved with the German Russian Community helps you make incredible genealogical discoveries. It was tough for me to choose a few from the many discoveries I attribute to the community. But here are two of my favorites. This first story starts in my childhood, during visits with my grandmother who was very proud that her family, the Herrmanns and her husband's family, the Dalhaimers, descended from the original settlers in Mariental. She also told us that her father-in-law told the story of the History of Mariental, but that my grandfather, who was very proud of his handwriting, wrote this story in a book. When we asked for a copy of the book, she said it was more like a pamphlet and she didn't have a copy. Perhaps there was a copy somewhere in Russia? She doubted it, she believed it must have been destroyed. 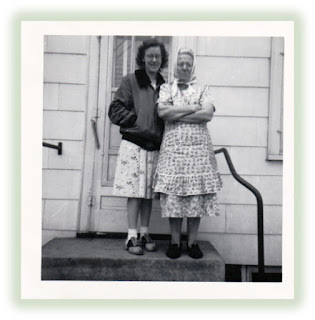 Sometimes the best part of the genealogical journey is the people you meet along the way who share the family history bug. I would never have learned as much as I do about German Russian history on my own as I did from all of the great people who I have met. These people challenge my curiosity and help me answer the tough questions. 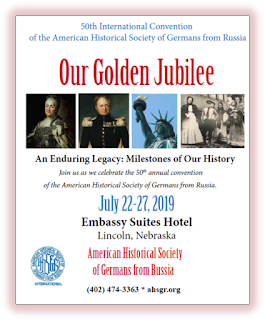 One of the best ways to find others who share your passion is through the national convention of two groups I mentioned earlier: the American Historical Society of Germans from Russia and the Germans from Russia Heritage Society. If you google Germans from Russia, you get over 24,400,000 results (in 0.55 seconds). That's an astronomical number of sites to cover to learn about our unique history. If I were starting to learn my family's history now, I would read some of the fantastic books that analyze our history in depth. While all of the sites I mentioned earlier as sources share some of the history of Germans from Russia, I believe that to get an in depth understanding, we need to read books. Development and Dissolution of the German Colonies.